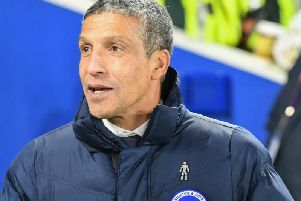 Brighton manager Chris Hughton spoke to the press this afternoon ahead of Saturday's trip to Burnley. Here are the key points from his pre-match press conference. "It's the circumstances of this league, it's a very tough and demanding league. "I also think the fact where they finished last season has raised expectations. "To play the Europa League games they had to play early in the season with the squad they have got, unless you are one of the top six teams anybody else would find it difficult. "I thought they were good last night against Liverpool and they aren't that much a different side than what they were last season. "Some of the elements have perhaps gone against them this season which didn't happen last season. "They are a strong team, particularly at home, and are very capable of putting a run together." "It's a big encouragement, you're always looking at how teams are going to respond. "It's like losing a game, how are they going to respond the next game. "The challenges of trying to win away form home, how are they going to respond to that? "You want as many encouraging reactions as possible, the more encouragement you get from the reactions, that speaks more about the team and the collective unit. "There are always things that are going to disappoint you but you have to grasp as many positives as you can. We've certainly had a few positives in the last few games." "My focus hasn't changed, irrespective of any league position. "It won't change. Once you start changing your focuses or start thinking you are a better team than what you are, then there can be a rude awakening around the corner. "For winning two games or three games on the spin which we've done this season, you can comfortably lose or not win five or six games. That's the level of the competition. "I don't think about a league position. What I do think about is making sure we can keep as big a difference as we can from those teams below us. "I just think about trying to improve as a team. If we improve as a team, we improve as a club and trying to get as many points as we can." "Our level of performance has really improved the last couple of games. "I have no doubt we are a stronger squad. If I look at what we brought in during the summer, we are a stronger squad than what we were at this time last season. "But ultimately it's just about points. I have to be delighted that our points tally is better than last season and I have to be delighted with where we are at this particular moment. "But you always have to be mindful in the same way you can win two or three on the spin, you can lose a series of games if you don't perform well enough. "At the moment we're in good form and that's what has given us a chance." "It's huge. This is how the game goes. "We win three games back to back, all 1-0, with performances that probably could have gone either way. "Then we're on the back of two defeats away from home, so you're wondering what the form is going to be like after that. "In a different way, I was really pleased with the result at Huddersfield. It was one that we deserved because of our level of performance. "This one even more so, not because it was against Palace and I know our supporters might think different but because they're a good side and I rate them very highly. "When you go down to ten men, it's not something we're not used to as that had been the case in the three games before that, but we're also on the back of a last home performance where we didn't do so well against ten. "There's some nervousness when you have a man sent off and you wonder which way it's going to go but I thought we were excellent." "I'm really pleased for him. He's one who trains well. "You wait for that opportunity and just hope that when it comes, you can put in a performance that will be on a winning side. "Two goals is the reward for the work he's put in." "We'll assess him in the morning. Probably this morning it wasn't as bad as what we thought it might be, so we'll assess him and give him every opportunity. "He went over on his shoulder and it was bad enough at the time to come off. It's not dislocated, all it is is sore so it's a lot better than what it could have been. "He's a doubt but we haven't ruled him out." "It's the same as Glenn. We expect both to train tomorrow and then we'll assess it from there. "He took a knock on his knee and was a little bit sore in the morning. "We've got a decision to make on them two." "He's fine but at this moment, it will be too early for Saturday. "It's a big boost for us. What he has meant to the team and the impact he has had, the fact positional wise he can play in a two or a three in midfield and has got some flexibility in his game. "It's good to have him back, particularly as over this Christmas period the games will come around. We'll possibly lose some through injury and when that's the case you're always delighted to bring somebody back in."